Seoul, South Korea (AP) — A South Korean delegation met with North Korean leader Kim Jong Un on Wednesday during a visit to arrange an inter-Korean summit planned for this month and help rescue faltering nuclear diplomacy between Washington and Pyongyang. The office of South Korean President Moon Jae-in said the envoys led by his national security adviser delivered his personal letter to Kim and “exchanged opinions” on unspecified issues. It wasn’t immediately clear whether the Korean officials fixed a date for a third summit this year between Moon and Kim or made any progress in breaking an impasse in talks between the North and the United States over dismantling Kim’s nuclear weapons program. When asked whether the meeting with Kim went well, Moon spokesman Kim Eui-kyeom said he didn’t know. The envoys are planning to fly back to the South after attending a dinner reception hosted by the North. Earlier on Wednesday, they met Kim Yong Chol, a former spy chief who has been negotiating with the United States on nuclear issues, and Ri Son Gwon, chairman of the North’s agency that handles inter-Korean affairs, at Pyongyang’s Koryo hotel. South Korean officials said they couldn’t provide further details. Moon’s office is planning to hold a briefing on the visit on Thursday. Moon, who discussed his plans with President Donald Trump by telephone on Tuesday, said before the trip that his envoys are tasked with a crucial role at a “very important time” that could determine the prospects for lasting peace on the Korean Peninsula. While an end-of-war declaration wouldn’t imply a legally binding peace treaty, experts say it could create political momentum that would make it easier for the North to steer the discussions toward a peace regime, diplomatic recognition, economic benefits and security concessions. 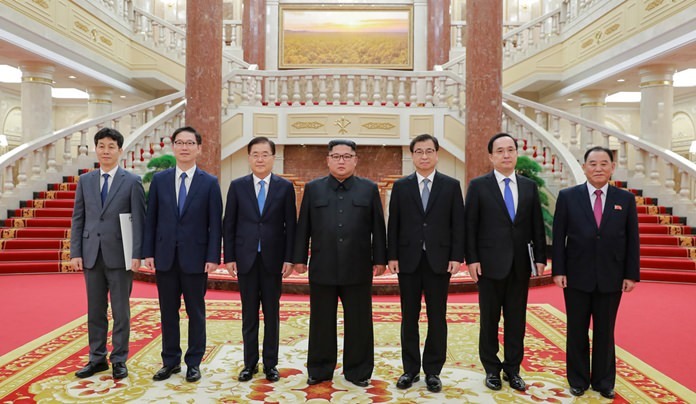 Moon’s five-member delegation, which also includes his top intelligence officer, Suh Hoon, consists of the same group that traveled to Pyongyang in March where they talked and dined with North Korean leader Kim and reached an agreement on the first summit between the Korean leaders in April. The South Korean officials later visited Trump at the White House where they conveyed Kim’s desire for a summit, to which Trump accepted on spot. Considering the difficult circumstances, it’s unclear whether Moon’s envoys would return with anything other than a fixed date for his new summit with Kim. The two past inter-Korean summits in April and May removed war fears and initiated a global diplomatic push that culminated with a meeting between Kim and Trump in June. But Moon faces tougher challenges heading into his third meeting with Kim with the stalemate in nuclear negotiations between Pyongyang and Washington raising fundamental questions about Kim’s supposed willingness to abandon his nukes.